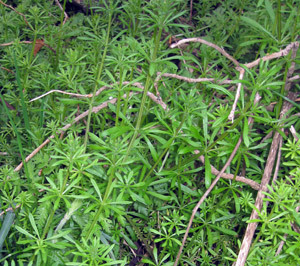 Stems of cleavers spread and sprawl across the ground or up and over other plants / shrubs; using these as 'supports' to help form a dense network of stems and leaves up to a height of 4 – 5 feet . This network can shade out other species beneath them, reducing competition for water and other nutrients. 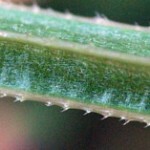 The leaves are simple, and are arranged around the stems in whorls (of 6 to 8). Each leaf comes to a point, see images below. 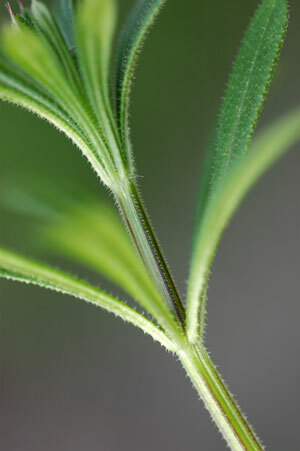 Both the stems and leaves of cleavers have many, minute hooks or barbs which help the plant to scramble over others. 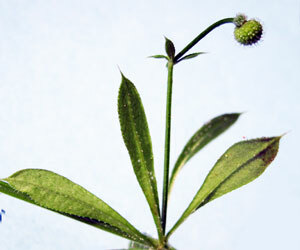 The flowers, which form in June through to August, arise in the leaf nodes. They are small and white, with four petals joined at the base and, when pollinated, these form small, spherical fruits which like the stems and leaves bear many small hooks. The fruits tend to occur in pairs, and a single plant may produce thousands in a lifetime. The seeds when dried and lightly roasted are said to give a coffee-like drink. bedstraws are slender, sprawling herbs that have square stems (in cross-section) and they belong to the genus GALIUM. 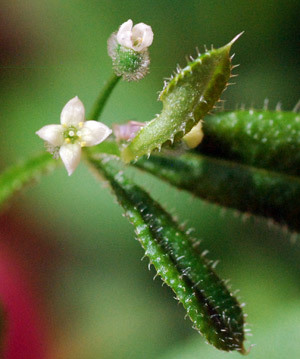 The genus Galium belongs to the family RUBIACEAE, which includes the Gardenias, Coffea (for coffee) and Cinchona (the bark of which yields quinine = Jesuits’ bark). Galium odoratum (sweet woodruff) is a woodland bedstraw, which tends to form ‘a carpet’ and is a perennial. Galium aparine ( aka goosegrass, kisses, cleavers, sticky bobs, sticky willy, sweethearts and robin run the hedge) is more common and is a ‘scrambler”; it is also an annual. 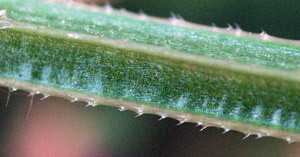 Cleavers is common in hedges, arable fields and gardens. Some Galium species, such G. verum (lady’s bedstraw) and G.odoratum (sweet woodruff, which has the largest leaves of the bedstraw family) are rich in a chemical – asperuloside, which gives a scent like that of newly mown hay or vanilla. Their dried leaves may be used in pot pourri or in former times for the packing of linen and in mattresses – hence the name bedstraw. Sweet woodruff has larger flowers and broader leaves than other bedstraws. The bedstraws are sometimes used by herbalists and can also be used to make a red dye.